Time ticks by... End of January and I still haven't updated this with what I have been doing over the summer holidays. This pic is taken before foam was finished... But all in place.. I will find a friendly upholsterer to make cushions and squabs for the seat... It is a great day bed. Before I finished the foam insulation I needed to fit the satelite dome onto the cab roof... I had debated with my self as to the ideal position of the dome... In the end I decided the cab would be good. We tested the antenna before putting it up and of course it didn't work... so had to take it back to supplier.. All they did was tweak the ballum or whatever the little thing is on the end of the stalk thingy...!! and away it goes. We tested it again once we had it back in Turangi.. It has a GPS chip on it so knows where to look for the satelite.. Clever gizmo. XC caught in the process of bolting the dome to the cab and fitting the cover. I finished off the foam insulation.. Man that is a hot job.. It can only be done on a hot day with a protective suit and mask on... Nightmare.. But it is done now and I am not spending any more money on insulation..!!! Of course as soon as you finish the last of the foam you find spots you have missed..!! mumble... It will do. First partition going in.. Man it is a nightmare trying to get everything square.. right angles with the floor.. the sides.. etc.. in the end I figured that the whole truck is not going perfectly square and moving all the time.. So as long as it looks ok... Note the foam squab in the shower tray... I dropped an electric screwdriver onto the tray and dented it...!!!! mumble grump..!!! typical...!!! so I will have a memory reminder of that moment..
More partitions going into place... I am cutting the frames in the garage so I am getting fit running from the truck to saw and back...!!! so many times..!!! Progress.. I am now in the process of doing the wall by the door which will hold the circuit breaker panel and electric guages and stuff like that... more thought required. Since my last update I have been pottering along with smaller jobs in the truck... things like drilling holes in the frames to run electrical cables from the battery compartment to where the switch panel is going to go... Also running plumbing from the temporary sink to the grey tank.. and plumbing from the pump to the sink... All mainly to keep the truck useable and able to be used for the odd weekend camp. XC hooking up the water to the tap in the temporary bench unit.. This will all be replaced when final cabinetry is done... At least we now have running water for our weekends away... should we find time to do them..!! Third upright behind the door... note also they had to bend the upright to follow the truck side which tapers toward the top. Awning can be seen on trestle in foreground... looks good. All done... a view from the rear before stowing it away and heading back to Turangi. A great job done by the guys at Making Shade check them out if you want the best motorhome awning available... Thanks Ron and Lance. TK had texted earlier and said she was not able to get her VTR motorbike going this morning and wasn't able to ride south on it... She wanted the keys to my V-Strom DL650 but I had them down in Turangi with me... so she was stuck as the car was already down there.. Things seemed to go quiet on the texting front so I ended up ringing her to find out what she wanted to do... No answer...??? I had just washed the truck and had pulled it forward a bit so we could get right round it... Now you can see that this cover is no small project.. It is HUGE...!!! the truck is 11.3 metres long... 2.4 metres wide.. and 3.6 metres high... So we have to work out some easy way to get it over the top of the truck... Yeah right..!! She figured if she put tennis ball on end of rope and tossed it over the top of the truck then go around the other side and just pull...!! Hmmm should work.. but we kept getting caught up in something on the roof... and wasn't easy at all... so decided to do it the hard way..
Of course I had to clamber down the ladder... It would be good to devise a way to get down again.. maybe a flap over the hatch I climbed up... then pull the flap back down.. The cover was not on my construction list but I wanted a light one to protect the paint work a bit.. A great job done by TK.. Thanks Sue... (Tick....) She should go into business custom making motorhome covers... any orders..? In the last post I did over the Christmas and New Year holidays you noticed I was getting frustrated with chasing rust on the outside of the truck.. I kept finding signs of the cancer and made desparate attempts to cut it out but being the amateur I am was not confident that I was doing a good job.... This cancer needs to be dealt with... By professionals. 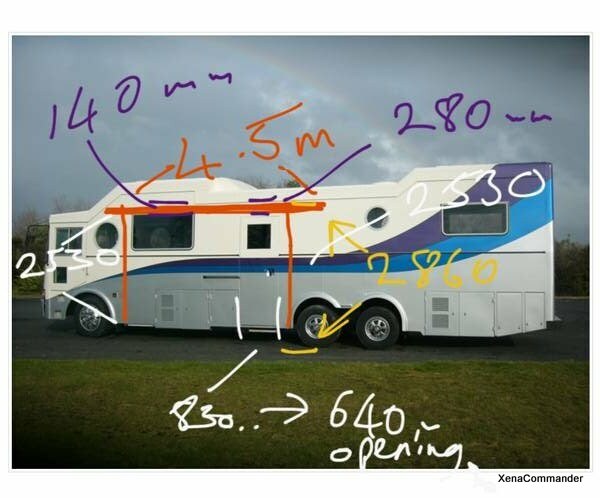 So I made enquiries from people I know and on the motorhome forum to get opinions as to who was the best at the job.. The truck was booked in.. Marty said that costs can be reduced by me going down and spending some time working with them... That week was the week of the annual Rusty Nuts Motorcycle Clubs Southern Cross Motorcycle Rally... Sacrifices have to be made for the sake of the truck. I drove the truck down to Levin on Sunday 6th March loaded with supplies to keep me in the basics for the week. The truck parked in Marty's yard.. Satellite hooked up for TV... Filling bucket with water for a portable shower that TK had purchased but I had not yet worked out how to use..! That should be fun..! After a walk around with Marty.. Making decisions as to what best to do... The decision was whether to remove panels to get at the worst of the rust... which would be better than just treating the parts where rust was visible from the outside.. That way it would expose the full extent of the rust... It would cost in steel but would save it preparation time. So it was a swings and roundabouts decision with a better outcome if I decided to remove the panels.... the decision was not difficult.. Just scary.. I had to deconstruct my truck...!! Not having done this sort of work before but open to new experiences.. Marty gave me a quick lesson with the Air Chisel... or hammer... not sure what you call it but an amazing contraption it is.. I ground off the rivet heads with my grinder and took the chisel to the panel... Result is above pic.. Peeling the truck.! The aluminium panels that were put over the old window was removed.. It was a badly done job that I was never happy with. I was glad to remove it. Another panel off.. exposing some nasty brown stuff... Every time I remove a panel and see the hidden cancer I am pleased with my decision.. Interesting that the window mistake I made earlier and decided to make a larger window on this side is now redundent as I can now use the original window if I want. But I am going to keep the larger window now. I was somewhat distressed when it became necessary to remove the windows that I had just installed over the holidays... But.. Needs must.. It was not easy.. That Sikaflex is good stuff and I got blisters using a fish fillet knive to cut it out.... Above you see the hole and the aluminium door panel cover coming off. Around to the other side... Again the windows had to come out... Except the rear bedroom one as there was no sign of rust around that panel... we shall see.. Starting at the front... Another horrible aluminium panel bites the dust... Very rusty underneath that... I will be removing some of that framing to fit the round window flashing. The air chisel makes short work of the rivets and spot welds holding the panels in place..Every panel I removed I exposed the cancer... so it was motivation to remove the next panel.. then the next. The following morning I continued to fabricate window surrounds for the round flashings. Pleased I took the welder and steel channel to finish the job.. It was essential before they repanelled and painted. The job had to get done.. I was on the welder at 0530 that morning and didn't finish until after 1800!! a long day.. I haven't done this much manual labour in a week for ages... The old body was starting to protest..! Finally completed.. The right hand side frame was the hardest.. I had to cut out a lot of the frame that was used for the hatch previously in this position... A nightmare to cut out but with good power tools and a bit of muscle it came out. Lightened the truck again..! After a final walk around with Marty and a discussion about colour schemes it is very apparent that the truck is not going to look anything like it is now.. He has come up with a proposed four colour scheme with my favourite colours in them... The graphic is very different .. a big up sweep the length of the whole truck..
Got an email from Marty with an update... Tee & John have now removed all sheets & parts.Tee has been around entire unit with the sand-blaster & rust gobbled . Tomorrow they will sand all frames to remove excess sikaflex ′ with sika primer ready for new electragalv sheets.The upper roof section will also be started. Lower panel-beating should also be started. Left side all stripped... Looks like door is removed too... Marty is going to have a go at fixing that too.. It will look better without the lower gutter channels. Rear panels off... and the bumper totally removed... those round light mountings are also going to disappear... My truck is totally naked...!! Not much more to come off.. so now the clean up of the frames and the reconstruction with new sheets... Exciting.. I got a shock seeing the truck all stripped down.. The guys had removed the rear as you can see above.. but also the front panels had been removed and even the passenger windscreen.. Work had started on the roof and the framing was primed. Sheets had been cut and were in the truck ready for installation I guess when Marty gets back from his trip to USA. Window was removed... Panels removed.. I tried to take a pic but my camera wouldnt turn on... mumble.. I tried to take one on my phone so might be able to get it here... Will post when I can.. I didn't have my welding gear so couldn't weld the frames to the window frame on the outside.. I hope I can get the guys to do that before panelling. Christmas Hols 2010 - Week 2 - Windows at last!!! After a week of not so good weather... I did manage to achieve the first goal and fit the hatches... and even had some down time... All good. Sunday 26th December: Boxing Day was a slow start although the weather was fine and going to be hot... I wanted to get up on the roof of the truck and seal the joints that I had uncovered and rust treated a week or so ago. I had noticed while it was raining the other day that water was getting in through the seams. Time to remedy this. You can see here I am applying 3M Extreme Sealant tape... Amazing stuff (and expensive!!) but you have to be careful applying it. Once you have stuck it down it isn't going anywhere. Once it is stuck down you run over it with a roller and crush it down to seal everything. Then remove the backing paper.. Amazing stuff should do the trick. Now it was time for the windows... I can do maintenance all summer but I want to make some construction progress.. Maybe I have been finding excuses to avoid making that first cut in the side of the truck... I don't have an issue with commitment... really...!!! no really...!!! So it was decision time.. Well lets do the bedroom window drivers side so you can't see any mistakes from the road side..!! I turned the truck around on the pad and used the hydralic levelers to get it horizontal. That should make the measuring easier. TK taking pics... It looks good from this side... Now to cut the frames still holding it on the inside. Frames al lglued in and being held in place by the clamps... There was no rain forecast overnight so I left them in and will weld them together tomorrow. Monday 27th December: This morning I removed the clamps and got set up for welding... Only to find that my mig wire was nearly out... and it was a stat holiday and no chance to get a new roll.. Mumble.. So I knew I was going to run out. Sure enough after welding half of the frames in place the roll runs out..!! So I spent some time planning for the kitchen window placement.. This means making some final decisions as to where things are going to be located in the finished motorhome..!! All done but I decided to postpone the cut for another day. TK and I went for a ride on Xena over to my cache at Adventure Headquarters stopping in to say hi to Annie and Paul... When we got back I decided to have a quiet afternoon and a break from the truck.. I put the window in place temporarily to keep the forecasted weather out of the truck. Tuesday 28th December: Rain... Rain... Rain... Another big front went over the whole country so I was relegated to clean up duties... sweeping up steel filings... and rubbish... and I even tidied up the garage.. TK will be pleased..!! The rain was useful in that it showed up a couple of leaks around the hatches... I will have to add more sikkaflex around the edges to stop water from getting in. I spe nt the rest of the day measuring up the rest of the windows... Measuring each one about ten times... All set for tomorrow with a better forecast. Wednesday 29th December: Up early for a run... Weather fine and clear...!! Yaay..! First job today was to ride Xena to Taupo to get supplies.. I needed more welding wire and cutting discs... I was back by 9:30am and was loading the wire into the welder and it all unravelled off the reel!!! talk about a birds nest.. Took half an hour to get back together and loaded. A coffee to calm the nerves... Then I finished welding the bedroom window frame.. Then the major step.. Glueing it in. All in place.. looks good.. I need to tidy up the edges of sikkaflex. This is best done when it is all dry..
Now on to the next window. I decided to do the kitchen next.. I had already marked it out yesterday so cut it out. Kitchen window cut.. Note the hatches and bedroom window open for ventilation... It makes such a difference in the truck with the extra light and it is not so hot with the flow of air through the truck. The rest of the day was spent cutting the existing framing back to allow new framing to go around the opening... This is laborious cutting and grinding... Then cutting the new framing to fit around the opening and glueing and welding it to the wall and existing frame. I just hope it doesn't rain tonight as I have left it open. Fingers crossed. Another fine day forecast for tomorrow. Hopefully I can get the other bedroom window in. Two windows in.. three to go... plus the round ones.. It is much lighter inside with each window installed. Xena even made an appearance..!! She has been banished from the garage while the work is going on...! Now for the other bedroom window... And I have a confession to make...!!! I stuffed up the measurements...!!!! After cursing and swearing for a while.. Ringing TK in Auckland and venting some steam.... I realised I couldn't do much about it.. I couldn't patch the opening and start again.. It would look awful.. So I continued with the framing... I will order another window from Lotus when they get back in the new year. Oh well.. I have made my mistake for the summer... Learn the lesson and continue.. and be glad it could have been a lot worse..
Friends Allan and Marge Salmon arrived for a few days in there motorhome... a great example and an inspiration for XC to get to the end of this project... One day..!!!. Saturday 1st January 2011: Today was the day to put the big lounge windows in... or at least prepare them for installation. Allan started cutting the frames inside and I cut the last bits I could reach from outside. XC has finished work for the year. After so much travel this year I am looking forward to being in one place (Turangi) for three whole weeks working on the truck. I have some goals set for myself over this summer... Mainly to get the hatches and windows in. Lets just hope the weather doesn't delay things. I finished work and picked up the hatches and drove south with TK saturday morning. Weather forecast is not good and it rained most of the way south. Saturday 18 Dec: The weather was horrible.. Heavy rain so I was not able to cut holes in the roof. So I worked in the garage removing the rust from the steel that had been sitting on top of the car since I picked it up last week.. It was fine until it rained but of course rust doesn't wait for anyone. It wasn't difficult to remove.. Just laborious. Once that was cleaned up I treated with rust kill. Before I primed it I noticed that the C channels weren't bent over 90 degrees and I needed to have them correct so I will have bend them. Once that was done I got the spray gun out and primed them ... At least that could be done in the truck while it was raining... Hope this weather clears. Another wet day.. . So decided to have a quiet day. I took the steel back to the garage and checked the paint and hand painted the bits the spray gun missed.. That all done the rest of the day was for R&R. Up early for a run between showers... Rain looked like it was trying to clear so decided to get up on the roof of the truck and cut the middle hatch hole. The most important step.. Measuring the opening. 627mm x 627mm I hope there is a couple of mil tolerance... What did my dad say.. Measure twice... Cut once.. I think I measured three times.!! Measurements done it is time to cut it out.. Using the angle grinder with cutting blade for the straight bits I am careful to follow the lines. Note the leather apron.. I have learnt the hard way.. Those sparks hurt. I cut the curves with a jig saw. The rain was still around but I pressed on between showers and covered up when it rained. Nice tidy hole... I used the grinder to smooth off the cut edges... I just hope the hatch fits. Yaay...! I had to slightly enlarge rear left corner but not by much.. then it fit in nicely.. Test fit only as I now have to glue/weld the frame around the edges. I knew I would get to use these clamps... I bought them when I was going to build a boat... But they work just fine for truck building... The C channel frame is already on front and back.. Here I am glueing them on left and right. Once glued in place I weld the edges to the cut frame to make the whole structure strong enough to bear my weight. Hatch back in place temporarily.. I will let sikaflex dry on frames before I glue in the hatch tomorrow. Today I had a big day... I cut the front and rear hatch holes... And framed them all up. A full day.. I didn't take any more pics as they were pretty much the same as the middle hatch.. Some of the framework for the front hatch was a bit more complicated than the middle hatch but I managed to fabricate a reasonable frame on both. All in all it was a busy day.. Weather looks doubtful for tomorrow so I put the hatches in place temporarily and hoped for the best. Rain... Rain... Rain.... Mumble...!! I decided to take the day off the build, jumped on Xena and did a trip to Hamilton to drop off presents. No progress was made on truck. Christmas Eve... The day I normally do my christmas shopping so I was out early to do the food shopping hoping I was early enough to beat the crowds. Looks like everyone else had the same idea.. lol..!! Once the shopping was done I was back in the truck and primed the frames before finally glueing in the hatches. That Sikaflex 221 is amazing stuff.. as long as you don't touch it while it is wet.!! The rest of the day I did some more maintenance.. On the rear I cleaned up the panel joints with isopropal alcohol and primed them ready for taping. I will do that tomorrow once the primer has dried. All in all a great first week of holidays.. Weather hasn't been the greatest but I managed to get the hatches in. Next week I will start on the windows.. Scary.. I have to cut holes in the side of the truck.!!! A weekend trip to Turangi on Xena was combined with some more work on the truck.. TK had driven the car down earlier with a load of supplies.. She had found a place to get pipe lagging tubes which was my next task and I went to Lighthouse Marine this week and purchased the Toilet that I wanted and Vacuum generator to drive it.. So the main task for the weekend was to fit the foam insulation on the water pipes. When the truck is finished and I am living in it full time it is my intention to spend plenty of time in cold climates so the pipes need to be well lagged to stop them from freezing. Next it was under the truck and wrestling with silver snakes.... measuring... cutting... tieing down.... I finally got them all done.. Looking good... all tied down.. I will lag the flexible pipe to the pump when I hook the pump up. Next I wanted to figure out where I was going to place the toilet and the vacuum generator.. This is the Dometic Sealand Vacuum Generator.. I found the only place to put it was between the chassis rails under the floor of the bathroom area.. Close to the toilet and only three or four metres to the black tank. Now I need to fabricate a bracket for it and then plumb it in. I started welding the tray that the ply wood will sit in. I will finish it next trip.